Kelsey is California girl who moved to New York City to be a part of a church plant in Astoria, Queens spring of 2016. 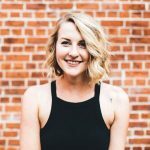 Roots Church launched January 22nd of 2017 and Kelsey has been working hard to assist in service coordinating, event planning, and evangelism efforts. Kelsey works part time at a local coffee shop, meeting new people every day. Her barista job gives her opportunities to invest in people’s lives and invite them to the newest church in Astoria.